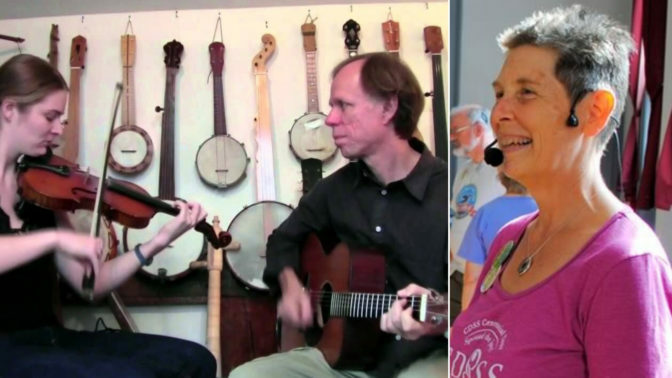 Our much loved Autumn American Contra Dance Week is hosted by Meg Winters with a great team from the USA: caller Brooke Friendly with music from Audacious (Larry Unger and Audrey Knuth). There will be dance workshops in the mornings, afternoons are free for you to explore this lovely area, and there are dances every evening. There will also be a musician’s workshop, so bring instruments if you play! Early booking advised. Brooke Friendly (Ashland, Oregon) is known for her warm yet commanding personality, her clear and concise teaching, her creativity, and her sense of humor and whimsy. She has a strong sense of what makes for a good community and she makes the learning experience fun and relaxing. A dancer for more than 35 years, Brooke co-leads a weekly English and Scottish dance, calls Contra and family dances, and has been on staff at camps, weekends, festivals, and workshops throughout North America and England. Brooke has been the programmer for the Bay Area Country Dance English week and is currently Secretary of the Country Dance and Song Society. Also a dance choreographer, she, with her husband Chris Sackett, has published five dance books (Impropriety Vols. 1-5) and produced six CDs with the band Roguery. She loves to sing, especially rounds. Audacious are Larry Unger and Audrey Knuth, a Boston based traditional duo playing for contra dances and concerts. Guitar and banjo player Larry and fiddler Audrey play exhilarating tunes with driving rhythms. Their concerts feature American and Celtic tunes with elements of other traditions including swing and blues. They also draw from Larry’s catalog of original fiddle tunes, which have been featured in several of Ken Burns’ documentaries.